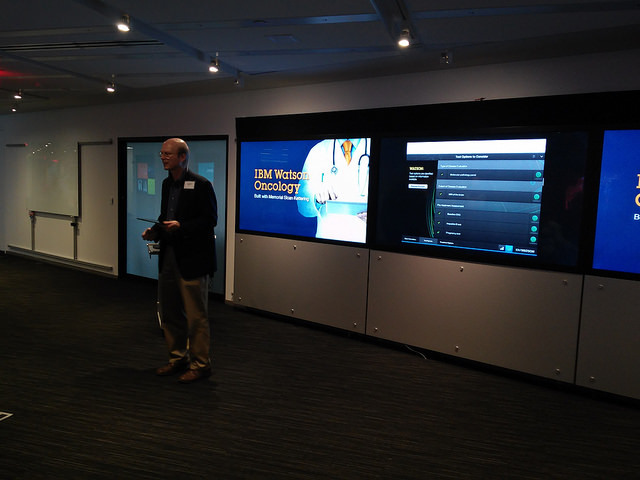 A day with Watson (at IBM TJ Watson Center) | Emilian Snarski M.D. Ph.D.
One of the questions I had before the trip was – can Watson computer be a challenge for a physician? Now after a day at the IBM I do have some thoughts on that topic. We were presented with a case of Adenocarcinoma stage IV. The treatment options provided by Watson did not include one quite important one: not giving chemotherapy but only supportive care. At this stage of tumor it might actually be better for a patient to be put into supportive care from the begining or at least tell about this option. This answer/possibility was not provided for physician. I had the feeling that computer biased towards the treatments for which there was a lot of clinical trials – however, again the trials with highest number and impact factor are usually the ones sponsored by pharma companies. The university trials – which might explore more fundamental questions which are not market driven might be under represented. So basically we do have computer that might put even more bias into interpretation of results of clinical trials – it will only be as good as people who designed it – now the real danger arises if the trial with Watson shows better outcomes for computer than physicians and it gets implemented into the guidelines. It could be easily used to further bias trial results – it could be possible to design trials and publication strategy to feed the way the Watson analyzes the data – what would this give us? The medicine in which it might be even easier to influence the way we treat not in the direction of better patient outcomes but higher revue from the oncology drugs. As a big fan of the whole Watson idea before I came to US, now I am a bit sceptical. It still too much dependence on human factor which can easily be biased.